We’ve been looking for an excuse to check out LeMay – America’s Car Museum in Tacoma, WA since its opening in June, 2012. Shortly after the New Year, we caught wind via social media that they were hosting the “Vee Dub: Bohemian Beauties Exhibit” featuring a collection of vintage Volkswagens. This exhibit is what pursuaded us to finally check this place out. It was a blustery day and pouring down rain so the only picture showing the exterior of the museum was this iPhone shot taken on our way out. A fellow VW CC owner had parked next to us. It was no surprise we would run into a few other VW enthusiasts. We recognized a few inside, too. The “people’s car” was represented well with 24 beautiful examples that sat on the entry level museum floor including 3 very rare Vee Dubs on loan from Volkswagen of America, one of which is the 8th oldest Volkswagen built and fully restored to “as-built condition” – a 1943 KdF Wagen in flat-black. The car features more than 95% of its original parts and looked as if it first rolled onto the showroom floor! The other two rare dubs included a 1954 Type 2 panel delivery van and the 1968 Wedding Car Beetle! Unfortunately we didn’t get a sharp enough image of the panel van so it didn’t make the cut. With no tripod allowed in the museum, getting a crisp and clear image was a challenge! (Especially with one lens lacking an image stabilization feature.) 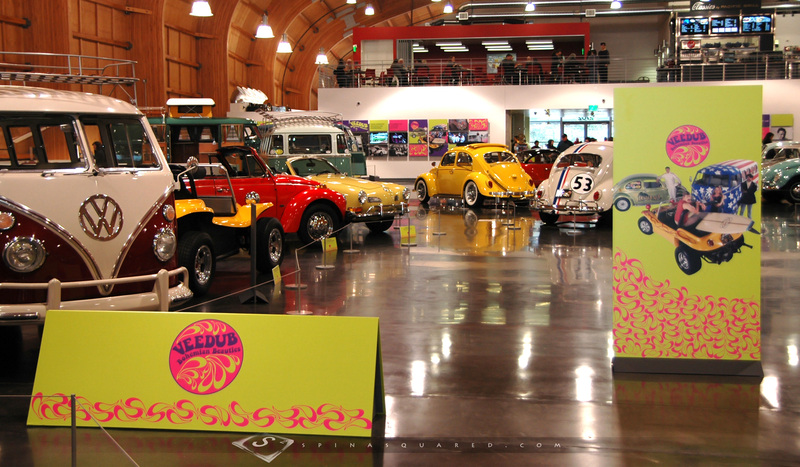 The VW exhibit will be at LeMay through April 5th though so we may go back and try again. We certainly didn’t get it all and had there been more time, who knows how many more images we would’ve brought back home with us. The rest of the VW collection consisted of local, privately owned examples of Beetles, Buses, Ghias, and even a Thing. Then it was on to check out the other car collection, the permanent residents of LeMay. 3 more stories and hundreds more fine automotibiles from past to present – a collection worth seeing more than once even if you aren’t a die hard automobile enthusiast! Click here to view the entire collection. Is this still going on? Looks good, I’d like to check this out. Sure is. Goes through April 5th.